I'm sure you have heard that after almost 10 years of development Final Fantasy XV has finally gotten a release date! To celebrate this, Square-Enix had a release date announcement party called Uncovered: Final Fantasy XV just a couple days ago. During this event there were about 14 announcements regarding Final Fantasy XV and I'll go over them below. Some of them I'll skip because they were little details that aren't as important. So I'll start off with talking about the release date. So, the official release date for Final Fantasy XV is September 30th, 2016. This was the last thing that they covered in this event. They added another trailer to watch and you can see it below. The next thing that I wanted to mention was that they released a demo on the 30th. I was able to download it and play it myself once it came out. I have to say I was disappointed, not in the gameplay or anything to do with the game itself, but in the fact that the demo takes about 20 minutes to beat. 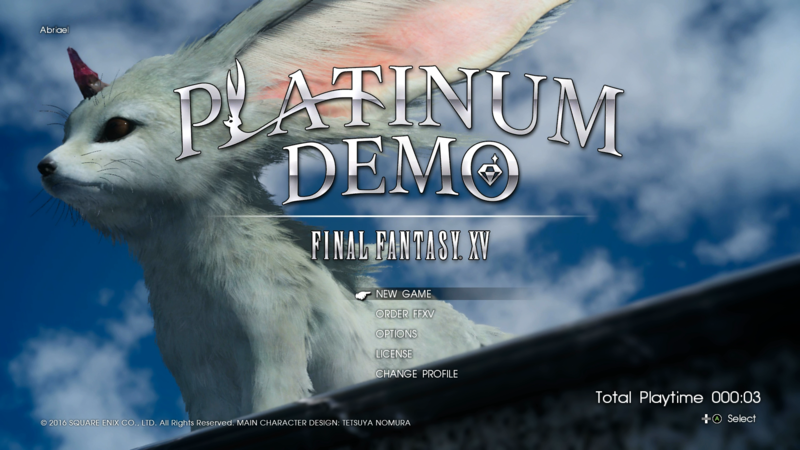 In comparison to the previous demos that Final Fantasy XV has had the amount of things in this demo is minuscule. When I heard demo I thought it would be of the same caliber as the previous one and not what they gave. What they gave out was a small, very small, slice of the game. Now in this demo there were a couple cool things. You play as a younger Noctis, he runs through a couple scenes of a dream level. You fight some monsters and use platforms that unlock things, and then fight a boss and you're done. A cool thing you can do is re-challenge the boss. The boss will come back stronger and you will fight it as an older Noctis. For a slice of the game this "demo" did a good job, it showed how the game is to be played for those who haven't had the opportunity to play the past demos and introduced some new elements to those who have played the past demos. The next thing that happened was the announcement of the movie Kingsglaive: Final Fantasy XV. This movie looks like it's going to be really good. The visuals alone look amazing. This movie with feature Sean Bean as Noctis's father King Regis Lucis Caelum CXIII, and Lena Headey as Noctis's betrothed Lunafreya Nox Fleuret. This movie takes place during the game, and it centered around what happens while Noctis is gone from the kingdom. Square said that this movie will be out before the game comes out. Square-Enix also announced that there will be an anime coming out called Brotherhood: Final Fantasy XV. This anime is about how Noctis and his friends meet and leads up to the movie and the game. This looks like an interesting thing and is already out. You can watch the first episode here on YouTube. They have also announced that it will be dubbed as well so you can look forward to that as well. Below is the trailer. On to the next thing, Square has also announced that there will be a mobile game coming out for Final Fantasy XV mobile app. This mobile game is called Justice Monsters Five. This looks to be a pinball style fighting game. In the past Square has been very innovative about how they come up with these kinds of games. Theatrhythm Curtain Call: Final Fantasy is an example of how they get creative with mini games. Apparently these games that you play on your phone can be linked to when you play the game in Final Fantasy XV. If you order to get this app early you can score some in-game credit. So that's about it for what happened at this event. It's great to see Square doing so much for this game since it's been in development for such a long time now. On the other hand I worry that they are beating a soon to be dead horse with how much they are putting out for this game. I have a good feeling about the Final Fantasy XV game but with all of this extra stuff I'm not sure how well it will do. From the previous demos's that I've played and watching the new content this new fighting style that they have chosen will work very will and is a lot of fun to actually play.